It is with great pleasure that Steritech congratulates CEO Murray Lynch on 35 years of service at Steritech. Murray has achieved a lot in his 35 years at Steritech. He has been instrumental in initialising the Steritech quality system, been influential in steering Steritech from a humble local service provider to an internationally recognised organisation and has successfully driven growth in technology. In 2010 Murray graduated from Melbourne Business School with an Executive MBA. In September 2016, Murray’s tireless work within the gamma irradiation field was recognised as he was nominated for the prestigious International Irradiation Association Business Laureate Award. Murray is a committed and highly respected CEO and employee of Steritech who has a natural ability to get the best out of himself and his staff. 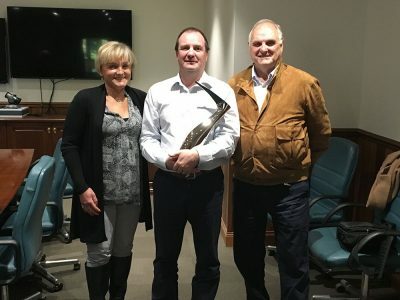 He is a forward thinker and a big picture man which is why Ian and Jennifer Dicker saw the opportunity to place Murray at the helm of Steritech. Staff, friends and clients congratulate Murray on his 35 years and we look forward to working with him for many more years to come.